Simply stunning sterling silver locket makes every day a special occasion. Open this elegant oval locket to find 2 frames perfect for loved ones' photos. Pictures are safeguarded with a protective covering when placed inside. 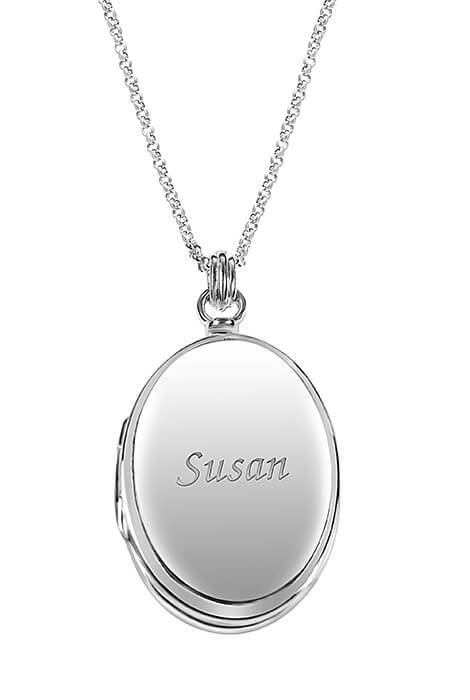 100% sterling silver locket can be made truly yours with personalization. Specify name: 1 line, up to 9 letters/spaces, upper/lower case. 3/4" wide x 1" high locket includes 18" long chain with lobster clasp. Makes a beautiful gift! Allow 4–6 weeks for delivery.